It is the transistor evolution which plays an important role for revolutionary developments in the society. The current flowing in the transistor is controlled by changing applied voltages. To sustain an ecologically reasonable status of the society, it is required to obtain the minimum current flow and power dissipation of transistors for certain applied voltages and operation tasks. 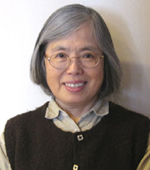 To realize the requirement, transistors are getting smaller and their structures are optimized. However, many undesired phenomena occur at the same time, which prevent a further evolution towards improved energy efficiency. We aim at contributing to the development of transistors and circuits for realizing ecological sustainability and complete energy recycling. 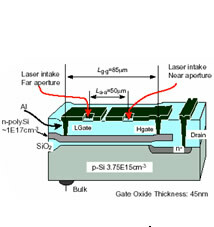 Through collaboration with industries we are working for ultra-thin-film transistors as an ideal transistor structure. We are also working for new material devices to realize better ecology of transistors. 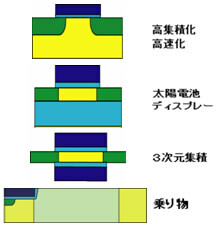 Undesired phenomena are being observed in the course of the transistor performance evolution. The dynamics of single carrier influence strongly on the performance of small size transistors. We are working for setting up measurement equipments and elucidating the origin of the carrier dynamics by appropriate theoretical modeling. One of our achievements has been selected as a standard circuit-simulation model for the world’s semiconductor industry and is thus used world widely. 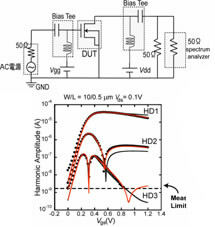 The model is names HiSIM and is a compact model for describing transistor performances with very essential equations. The developed models are delivered into the public domain through our homepage. In a synergy project within our university, which includes research groups specialized in the field of medicine and chemistry, we are working towards the development of an artificial lung. Our contribution is to realize the necessary integrated circuits with flexible organic transistors on plastic material. Fig.1. Different transistor types and their HiSIM versions. Fig.2. Measurement of high frequency response of transistors. Fig.3. Transistor operated by light. Facilities required to measure unexpected phenomena are provided together with those resources necessary to setup new types of measurement systems. To simulate carrier dynamics and to investigate the origin of the transistor performances, more than 60 PC are also provided. Most of organic and biological materials are semiconductors. Transistors realized with those materials must have the same characteristics as conventional silicon transistors. We can contribute to a further step in transistor evolution by understanding the principles of the transistor performance with these unconventional materials for different practical aspects.